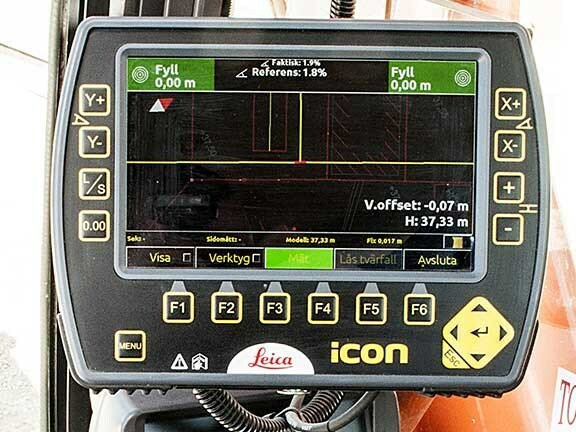 Italian geo-measurement group Leica Geosystems has announced its popular iCON machine control system for excavators is now compatible with tiltrotator control systems from Swedish firm SVAB. The partnership between the two companies means the Leica iCON iXE2 and iXE3 2D and 3D control systems for excavators will now be able to read rotation data collected by the SVAB software and incorporate that info into the automated machine movements. The iCON systems are popular among excavator operators as a standalone machine control system for use on any brand of excavator. The iCON system is also fully integrated into Liebherr’s propriety drill control system, LIPOS. The systems use data collected from sensors placed on the arm and bucket of the machine to automatically guide machine movements according to a master plan. This ensures the job is done correctly first time regardless of the operator’s experience or skill level. "The Leica Geosystems and SVAB partnership brings additional productivity enhancing solutions to the heavy construction industry," Leica Geosystems program manager Nick Guadagnoli says. "SVAB and Leica Geosystems are exploring further cooperation in a number of areas to offer contractors innovative technology solutions for excavators." It is hoped the partnership will give customers greater flexibility in the types of tasks they can perform with the Leica control system. It will also expand the global footprint of both companies. "We look forward to working with Leica Geosystems to lead together the transition from traditional solutions to innovative technologies in the machine control industry," SVAB CEO Fredrik Eriksson says.